Tiehua Music Village, a creative haven for Taitung’s emerging artists and musicians, is an intriguing attraction for visitors – whether domestic or international, to spend an afternoon or evening. The music village is a place where many of Taitung’s indigenous residents come together to share arts and music to the community. Located in the heart of the city, its music comes to life every Wednesdays to Sundays. Once an abandoned old dormitory for Taiwan Railways Administration operators, there, you will be able to experience exciting live music performances, discover unique local arts and handicrafts, and savour unusual flavours from the local market and bar. Taitung, a city known for its award winning musicians, such as A-mei, Suming, Kimbo, to name a few, never existed a performance platform for musicians, until the establishment of Tiehua Music Village. The venue gives emerging artists a chance to unveil their talents, and for successful artists to return to their hometown to perform and exchange ideas. 70 percent of the performances at the Tiehua Music Village are local Taitung artists. Each month, different artists from across Taiwan are invited to perform there. Its exciting agenda brings audiences a different experience in their every visit, and a venue where indigenous talent comes together. 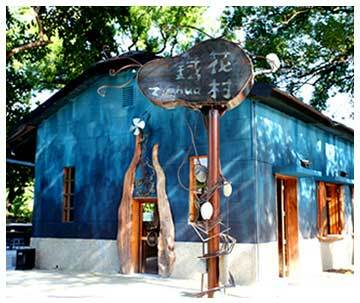 Visit the Tiehua Village, and enjoy the Tiehua Bar, where unique drinks are made from fresh local ingredients, stop by the Hao De Bai (translated: good to buy) shop, and purchase local handicrafts made from different indigenous tribesmen/women, and swing by the Tiehua Hao shop, where more art goods can be found. On Fridays and Saturdays, walk around the local market surrounding the village, with over 20 vendors selling handicrafts, organic farmed goods, handmade soaps, and much more, with every vendor displaying its own individuality. Experience rich indigenous cultures where arts and music come together at Tiehua Music Village, where you can enjoy the laidback lifestyle of Taitung, listen to the beautiful voices of Taiwan, and enjoy a cool evening breeze. The village is surely a must-see attraction in Taitung, not only for music and art aficionados, but for one that is there to spend time with good company.